Gravity concentration allows us to recover metals and minerals down to a minuscule 3 microns in size. If you missed Part One, we went over the metals you can recover with our Falcon SB Gravity Concentrator. Be sure to go back and read it if you haven’t already. 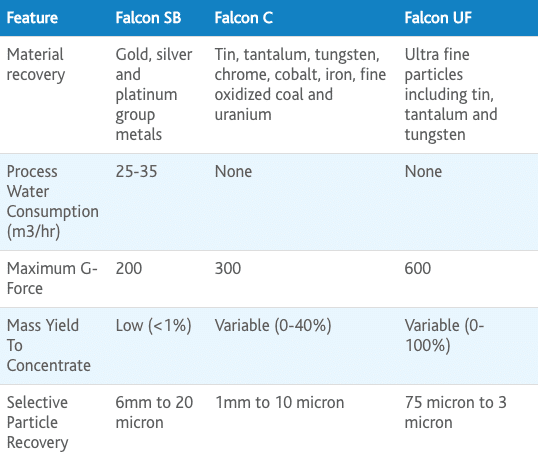 For Part Two we are looking at the elements you can recover with our Falcon C and UF models. Tin is possibly the most recognized metal on the planet, all thanks to the tin can. It might surprise you to learn that tin cans are mostly made from aluminum and tin is only applied as a protective layer. The properties of tin render it both rust and corrosion resistant, making it a popular coating for other metals. The most common use for tin today is for making pewter and solder. Pewter is an alloy created from tin, copper, and antimony. The malleable properties of pewter make it perfect for creating tableware, decorative ornaments, trays, and other household items. Solder is used to fuse other metals together, creating a permanent bond. The word solder comes from the Latin solidare meaning “to make solid.” Solder is what connects the wires on a circuit board. Tin’s low melting point makes it a great ingredient in solder. Tantalum belongs to the refractory metals group, a class of metals that are highly resistant to heat and wear. It is extraordinarily corrosion-resistant, strong, and very rare. Over half of the tantalum mined in the world goes into making capacitors for electronic equipment, as it can hold a higher charge per gram versus other metals. Capacitors can be made much smaller thanks to this fantastic metal! Tantalum has the fourth highest melting point of all metals. When it is combined with other metals to form alloys, it increases their durability and raises their melting points. These properties make tantalum attractive to the chemical, pharmaceutical, and petrochemical industries. Tungsten has the honour of having the highest melting point and tensile strength of any metal. It’s so hard in fact that certain tungsten alloys need to be shaped with diamonds. Tungsten is almost always combined with other metals to form alloys. The incredible properties of tungsten give the metal particular uses, mostly in high-temperature applications like arc welding and heating elements in furnaces. Hard metal tools made from tungsten and alloys are used to shape other metals. Chromium, or chrome for short, is another popular, recognizable metal. Shiny and mirror-like, chrome is corrosion resistant and used to make stainless steel or to plate other metals with a shiny coating. Stainless steel is well known for its ability to prevent tarnishing, and the higher the chromium content, the more tarnish resistant it becomes. Decorative chrome plating used for car bumpers or motorcycle parts adds a polished look to vehicles. In reality though, what you’re seeing is the effect of nickel plating. A layer of nickel is electroplated onto the vehicle part before a thin coating of chrome is added on top. The chrome is applied to protect the nickel from tarnishing and scratches while the nickel provides a decorative, reflective surface. The popularity of cobalt has shot up in recent years due to its demand in the automotive industry. Cobalt is essential for creating the powerful rechargeable batteries used in electric vehicles. Demand for the metal is only expected to increase alongside consumer demand for electric vehicles. Cobalt mixes well with other metals to form alloys. Cobalt alloys are resistant to high temperatures making them suitable for aircraft engines or turbine parts. Orthopedic implants and prosthetic parts (think hip and knee replacements) contain cobalt alloys due to their wear and corrosion resistance. Uranium ore is quite common. It can be found in a few parts per million almost everywhere on the planet including in rocks, soil, lakes, and the ocean. On the other hand, high-grade uranium is tough to find. The only high-grade uranium deposits are currently found in the Athabasca region of Canada, which supplies roughly 20% of the world’s uranium. To no one’s surprise, the primary use of uranium is in nuclear reactors. One kilogram can produce as much energy as 1.3 million kilograms of coal. Uranium’s other primary use is in the military industry where it powers atomic submarines and is a component in nuclear weapons. How Can These Metals Be Economically Recovered? 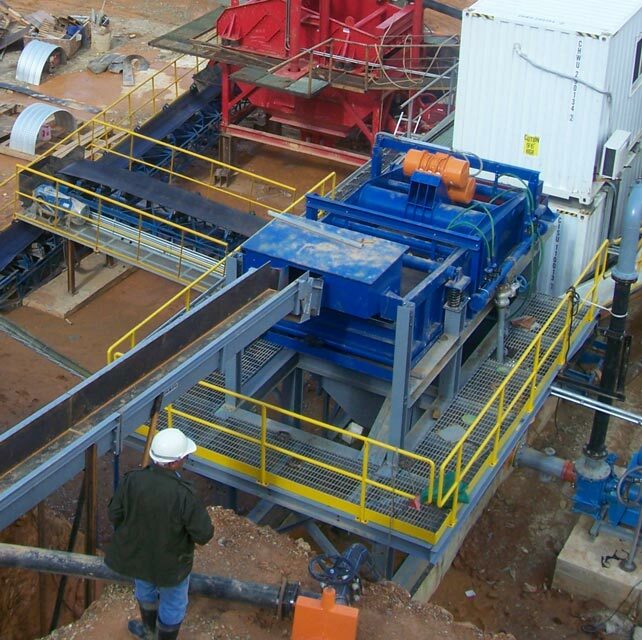 To optimize the mineral recovery rates of your next project, speak with our gravity concentration experts or give us a call toll-free at 1-800-990-5568. With operations in over 94 countries, we’re never too far away to help.